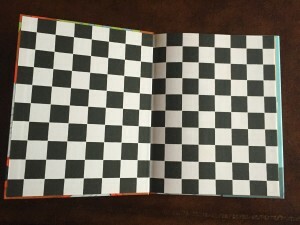 Endpapers are the first pages and the final pages of a picture book. They work much like the curtains at the open and close of a play. While many books’ endpapers are a solid color, others give the reader so much more. For instance, endpapers can create a mood. 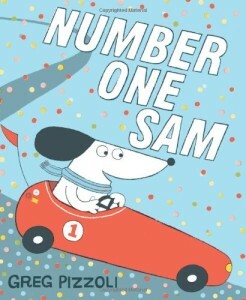 Number One Sam, written and illustrated by Greg Pizzoli, stars a racecar-driving dog who wins every race. Until he doesn’t. 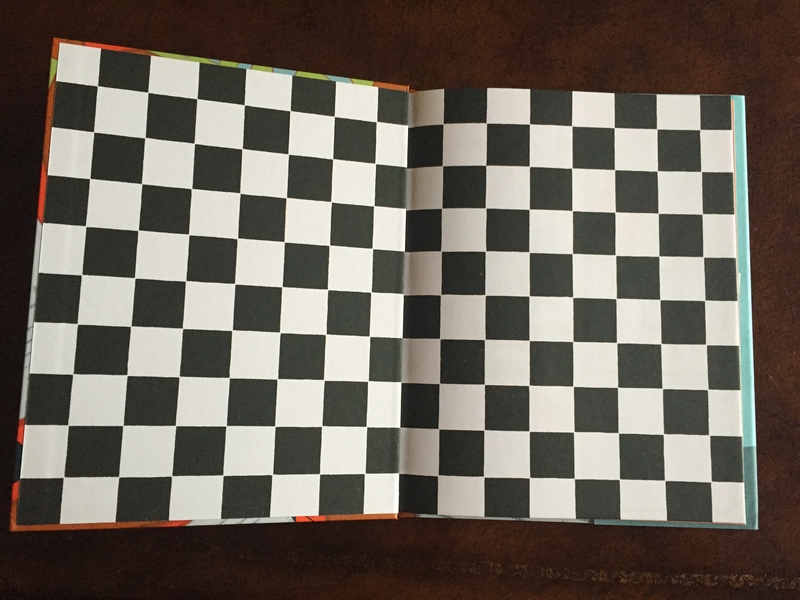 The endpapers look like checkered flags. They give us the feel that we’re at the racetrack right alongside Sam. Endpapers can offer bonus details for the reader to pore over. 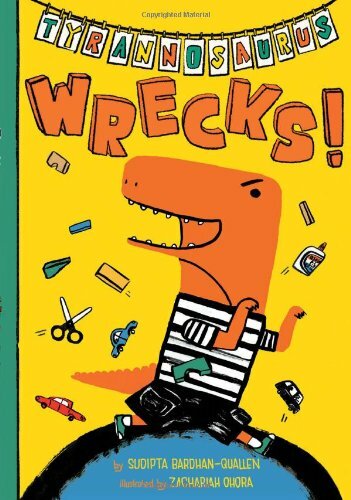 Tyrannosaurus Wrecks!, written by Sudipta Bardhan-Quallen and illustrated by Zachariah Ohora, stars an overenthusiastic dinosaur who wreaks havoc wherever he goes—much to the dismay of his classmates. 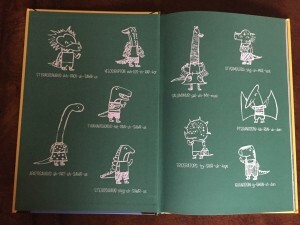 The endpapers not only showcase the various dinosaurs included in this book, but they tell us how to pronounce their names. Genius! Endpapers can extend the storytelling. 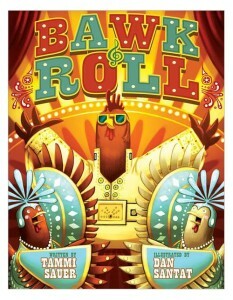 Bawk & Roll, written by Tammi Sauer (me!) 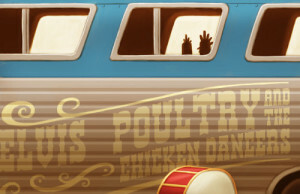 and illustrated by Dan Santat, stars two chickens, Marge and Lola, who get invited to go on tour with Elvis Poultry. All goes well…until the chickens chicken out. It isn’t until Marge and Lola realize how much they miss the support of their friends that they come up with just the right solution to deal with their stage fright. The front endpapers show a shadowy image of Marge and Lola alone on the tour bus. The back endpapers are different. 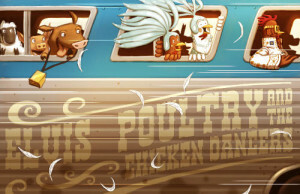 They show the chickens—along with their friends and in full-color glory!—on the same bus. Grab a pile of picture books and take a moment to ooh and aah over their endpapers. Do you have a favorite set of endpapers? If so, please share! 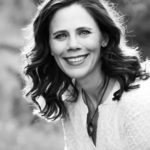 Kristi Dee Veitenheimer and Colleen Kelley! Special thanks to everyone who left a comment. Bawk & Roll, Dan Santat, Greg Pizzoli, Number One Sam, Sudipta Bardhan-Quallen, Tammi Sauer, Tyrannosaurus Wrecks!, Zachariah Ohora. Bookmark. The Dazzling, Amazing 104-Page Picture Book! My all-time favorite endpapers are probably in Office Buckle and Gloria. Peggy Rathmann used them for Gloria’s hilarious “safety tips.” I also love how David Small uses endpapers to extend the story in both directions in all of his books. Great post! YES! Those safety tips are hilarious. The endpapers for Goldilocks and the Three Dinosaurs remind me a little bit of those for Officer Buckle and Gloria. The endpapers show tons of options for what the book could have been about and each idea is crossed off with a big X. Agree with Linda here. David Small is a genius with end papers. One of my recent favorites is LOCOMOTIVE by Brian Floca. While the story, itself, is about a trip on the Transcontinental Railroad, the endpapers are devoted to the history of the construction of the Transcontinental Railroad and steam power used by the trains – all surrounded by Brian Floca’s beautiful illustrations. I adore endpapers – great post! Love this post. I see Liz mentioned my favorite endpapers. LOCOMOTIVE is such a lyrical story. The endpapers just add to it. I agree with Linda Ashman–OFFICER BUCKLE AND GLORIA. I absolutely love endpapers too, and author/illustrator notes. 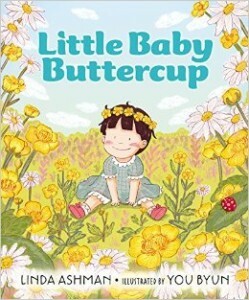 *The Right Word–Melissa Sweet outdid herself! I’ll have to re-visit Office Buckle & Gloria. And Locomotive and Moonshot are both amazing! Yes! Endpapers are important! The ones in “Where the Wild Things Are’ are among my favorite. I was at B&N yesterday and had to revisit those endpapers. They’re gorgeous. I love the endpapers in Mr. Tiger Goes Wild by Peter Brown, and Buddy and the Bunnies in: Don’t Play with Your Food! by Bob Shea. OOOH! Can’t wait to see your endpapers, Penny! 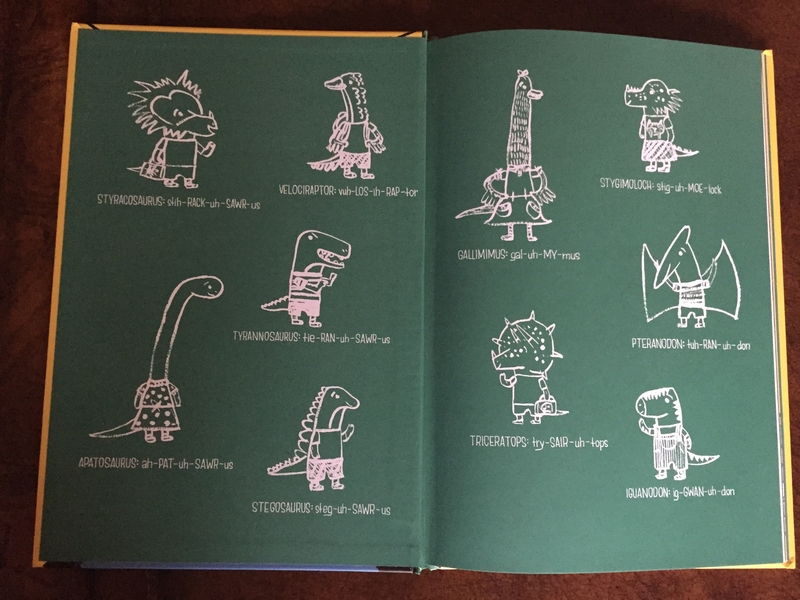 “Z is for Moose” by Kelly Bingham has adorable endpapers that introduce what is coming and give a sense that the characters hate to end the book! I enjoy looking at end papers, too. They are a great way to set the atmosphere for the book. Thanks for sharing, Tammi! Reason #13898 why illustrators are amazing: Endpapers. I love end papers, especially ones that “start” the story. I LUV wacky endpapers! I think it’s just another way we can interact with the child we’re reading to. I love endpapers, too. I like the ones mentioned here but maps are my favorites. I’m working on a story that began with an idea for endpapers. I love endpapers, and still stroke the gorgeous ones in really old books, the ones that looked like marble paper, all before printing in color became much easier. I’m a fan of endpapers too. The rabbit problem by Emily Gravett is a wonderfully funny story with adorable endpapers – the one at the back being a pop-up showing exactly what is meant by a rabbit problem. I haven’t read that book in a while. I must check out those end papers! I love that kind of dedication. I will undoubtedly pay much more attention to endpapers now — happily!